1 piece lightweight, neoprene scuba fabric dress. Full length, long fit-and-flare. Satin ribbon and transparent chiffon sleeves with flared cuffs. Giant rose trim at neckline. Lightweight, neoprene scuba fabric pantsuit. Straight ankle length pants, lace top over solid bodice. Dramatic oversized ruffle half-sleeves. Full length cascading fabric trim at back. 1 piece lightweight, neoprene scuba fabric dress in polka-dot pattern. 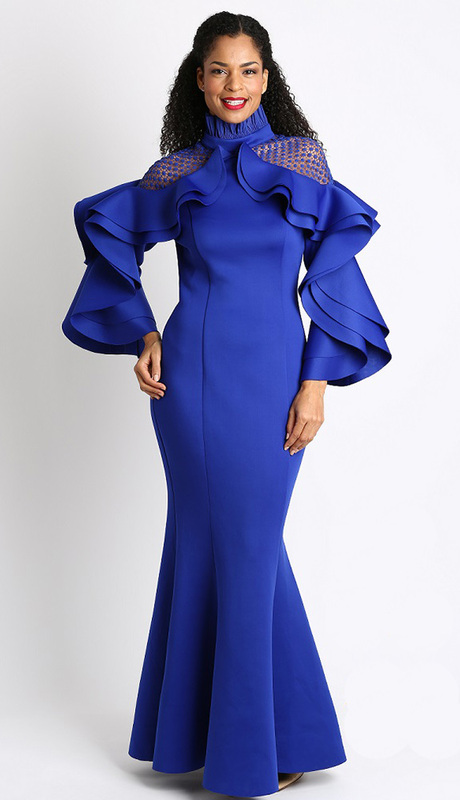 Asymmetrical ruffle hem, elbow length sleeves, oversized bow at neckline. 1 piece lightweight, neoprene scuba fabric dress. Full length, long fit-and-flare. Dramatic ruffle sleeves, lace peek-a-boo shoulder cut-outs, high ruched collar. 1 piece lightweight, neoprene scuba fabric dress. Fit-and-flare long, full length hem. 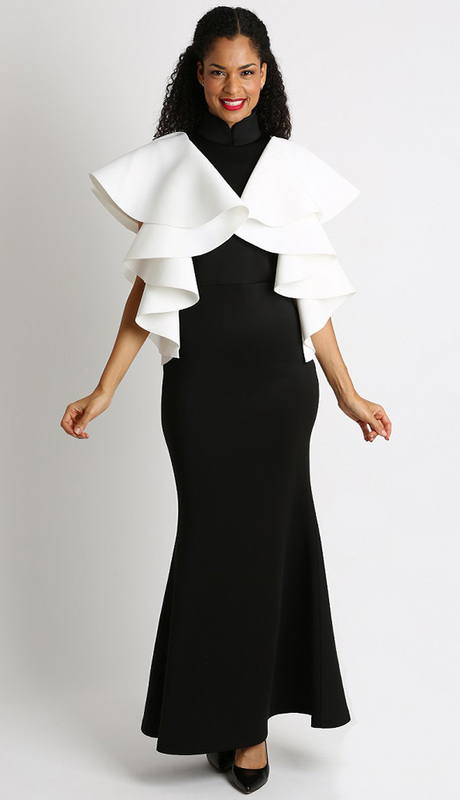 Dramatic, oversized contrast ruffle trim from shoulder to hip. High mandarin collar. 1 piece lightweight, neoprene scuba fabric dress. 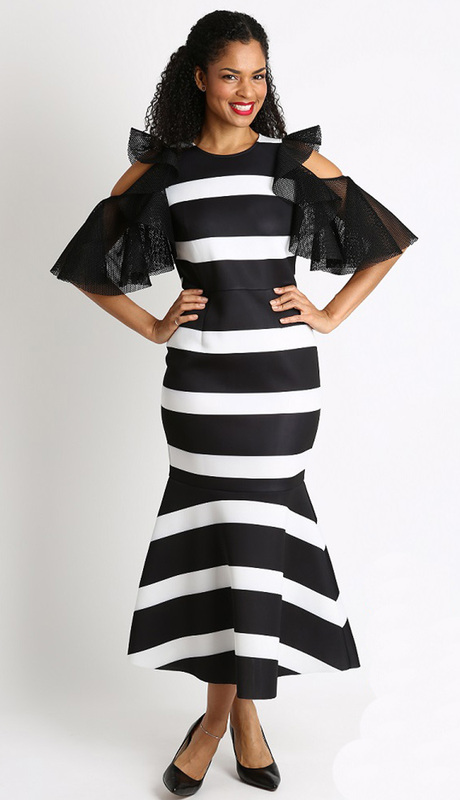 Striped fit-and-flare with full length, long hem. Sleeveless cross-over wrap in contrast stripes. 1 piece lightweight, neoprene scuba fabric dress. Vertical striped fit-and-flare. Dramatic ruffle sleeves with lace peek-a-boo shoulders. Sash belt. 1 piece lightweight, neoprene scuba fabric dress. Striped fit-and-flare. Pleated tulle fabric half-sleeves with shoulder cut-outs. 1 piece lightweight, neoprene scuba fabric dress. 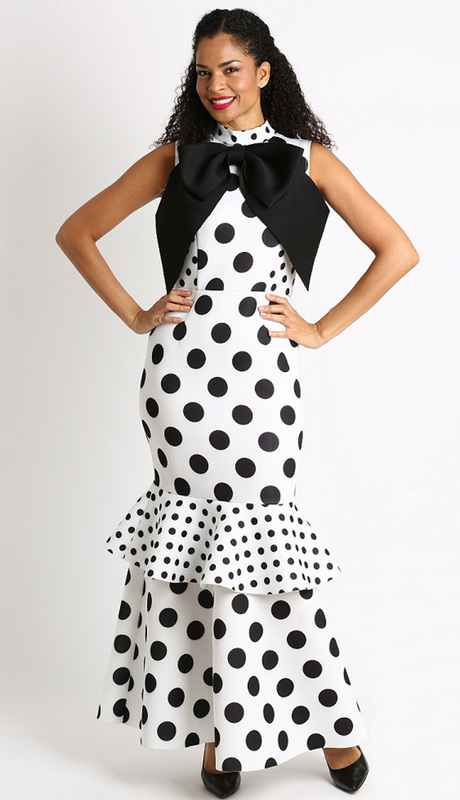 Sleeveless fit-and-flare polka dot pattern, long full length hem, giant bow trim at high neckline. Three piece silky twill suit with sweetheart neckline cami, straight skirt with dimensional embellishment, jacket with elbow notched sleeves, regal collar and jeweled brooch clasp. 2 piece silky twill fit and flare dress with modern abstract to solid effect, and large rose brooch. 3 piece suit with cami, straight classic skirt, notched collar diamond textured jacket with jeweled clasp. PRE-ORDER WILL SHIP 3/20. Three piece brocade suit, cami, straight skirt, fit-and-flare collarless jacket with jeweled brooch clasp. 3 piece silky twill suit with straight lace patterned skirt, lace cami, simple collarless jacket and jeweled brooch clasp. 2 piece silky twill dress with sequined floral collarless jacket and jeweled clasp. 3 piece silky twill suit in a mini-pattern, cami, long pencil skirt, fit-and-flare collarless jacket with jeweled brooch and clasp. PRE-ORDER WILL SHIP 3/20. Three piece brocade suit, cami, straight skirt, classic collarless jacket with jeweled clasp. 2 piece silky twill pantsuit with slimming princess seams, notched collar, jeweled buttons and jeweled brooch. 2 piece pantsuit in silky twill, elegant fitted jacket with novelty seams and jeweled buttons. PRE-ORDER WILL SHIP 3/15. Three piece silky twill suit, cami, straight skirt with brocade and jeweled side seams with matching trim collarless jacket. 2 piece silky twill suit, straight classic skirt, fitted jacket with jeweled buttons. 2 piece brocade suit with shawl collar, three quarter sleeves, flare skirt and jeweled brooch. PRE-ORDER WILL SHIP 3/20. Three piece silky twill geometric small patterned suit, cami, flared skirt, fitted jacket with decorative clasp. PRE-ORDER WILL SHIP 3/20. Three piece metallic suit, cami, straight skirt, jewel trim jacket and jeweled clasp. PRE-ORDER WILL SHIP 3/20. Three piece small flower patterned suit, cami, straight skirt, collarless jacket and jeweled clasp. PRE-ORDER WILL SHIP 3/20. Two piece silky twill collarless jacket with lace dress, jeweled brooch and clasp. Two piece floral sequined straight dress with three quarter sleeve silky twill simple jacket, notched lapels and jeweled clasp. 2 piece jacket and dress in silky lace twill with jeweled brooch. 2 piece tiered dress with lace trim and long sleeve jacket in silky twill. Large jeweled closure and jeweled brooch. See other 8139 photo for other color options. 2 piece tiered dress with lace trim and long sleeve jacket in silky twill. Large jeweled closure and jeweled brooch. See other 8139 photo for Red. PRE-ORDER WILL SHIP 3/20. Three piece brocade suit, cami, fit-and-flare skirt and jacket, with jeweled clasp. Three piece silky twill suit, cami, fit-and-flare skirt, collarless brocade patterned jacket with sheer sleeves. Three piece silky twill suit, cami, long lace skirt, silky classic fit-and-flare collarless jacket with jeweled brooch. 2 piece silky twill/organza long dress with cropped open jacket, ruffled side seams, embroidered and jeweled trim. Three piece silky twill suit, lace cami, full lace trimmed skirt, fit-and-flare jacket with jeweled brooch clasp. 1 piece fit and flare lace dress with long sleeves, satin waist and jeweled brooch. 3 piece lace suit with silky cami, unstructured jacket and long slim skirt. 1 piece fit and flare linen dress with floral embroidery accents and elbow length sleeves. 3 piece suit with flared skirt, long sleeve jacket and jeweled clasp. 3 piece shantung suit with cami, straight skirt and three quarter length scalloped sleeve jacket, both trimmed with cut-out leaves. 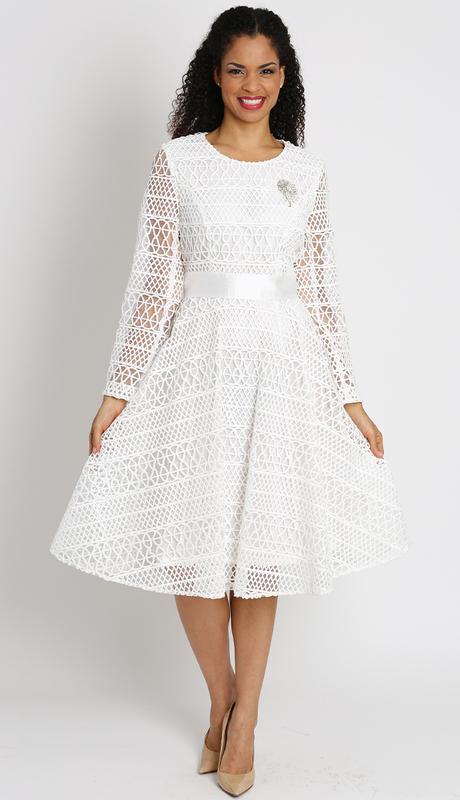 1 piece knee-length lace dress with cap sleeves. 2 piece silky shantung suit with flared skirt and floral embroidered jacket. 2 piece shantung suit with floral embroidery, pleated kick skirt, jeweled button jacket with three quarter sleeves. 2 piece dress with silky twill full length jacket, lace bodice and sleeves, jeweled brooch clasp. PRE-ORDER WILL SHIP 3/20. Three piece silky twill suit, cami with sheer overlay, straight skirt, jacket with flared sleeves and mesh flouncy trim. 2 piece dress and long sleeve jacket with rhinestone trim. 3 piece classic suit with cami, straight skirt, and long sleeve jacket with rhinestone trim. 2 piece shimmery, floral pattern suit, pencil skirt, fit-and-flare jacket with high wrap around collar. PRE-ORDER WILL SHIP 3/15. Three piece silky twill suit, cami, floral patterned long straight skirt, contrast jacket with double lapels, lace sleeves and jeweled brooch clasp. Three piece silky twill suit with layered diagonal seams, long length, fitted jacket in abstract print with puff shoulders. PRE-ORDER WILL SHIP 3/15. Three piece silky twill suit, lace cami, straight lace skirt, silky jacket with lace trimmed shoulders and jeweled clasp. 3 piece silky twill suit, cami, long straight skirt, collarless jacket with decorative contrast opening and jeweled clasp. Three piece silky twill suit with cami, full pleated skirt and long sleeve fit-and-flare jacket in a vivid geometric print. One piece fit-and-flare silky twill dress with double lapels, bow-cinch sleeves and wide sash belt. See additional 8222 photos for Red, Royal, Black/White and Pink/White. One piece fit-and-flare silky twill dress with double lapels, bow-cinch sleeves and wide sash belt. See additional 8222 photos for other color options. One piece fit-and-flare silky twill dress with double lapels, bow-cinch sleeves and wide sash belt. See additional 8222 photos for other color options. Colors Black/White and Pink/White will ship 3/15. 2 piece dress in textured crinkle with jeweled embellishment, fit-and-flare skirt and blouse. One piece modern textured dress, high v-neckline, fit-and flare sleeves. PRE-ORDER WILL SHIP 3/20. Two piece flowy organza dress with ruffle collar jacket, sheer flared sleeves, and jeweled clasp. Three piece crepe suit with embroidery trim, cami, long fit-and-flare skirt, collarless jacket with jeweled clasp. PRE-ORDER WILL SHIP 3/15. Two piece full length long flowy dress with satin ribbon striped long sleeve jacket. PRE-ORDER WILL SHIP 3/15. Two piece full length long lace dress with satin ribbon stripes and short sleeve jacket. 1 piece long sleeve lace dress in classic cut. 3 piece silky twill suit with cami, long ruffled skirt, fitted jacket with ruffled sleeves and collar. 2 piece circle patterned suit, ruffle hemmed dress, ruffle trimmed bell sleeves, and large rose brooch. PRE-ORDER WILL SHIP 3/20. Two piece organza flowy flower patterned dress, shawl collar jacket with bell flare sleeves, jeweled clasp. 2 piece suit with fit-and-flare skirt, solid and peek-a-boo fabrication, jeweled button jacket. 1 piece knee length linen dress with flowy sleeves, scalloped hem and floral embroidery. One piece simple lace dress with elbow length, airy sleeves. 1 piece silky twill fit-and-flare dress with lace cut-outs. 1 piece metallic dress in geometric brocade with bow at collar. PRE-ORDER WILL SHIP 3/15. Three piece silky twill suit, cami, straight lace skirt, classic jacket with lace collar and jeweled clasp. 2 piece metallic straight dress with shawl collared jacket and jeweled clasp. 2 piece metallic floral print dress and jacket with rhinestone trim at collar. One piece knit dress in solid/metallic color blocks, with flared hem and flared sleeves. 2 piece silky twill dress, button front jacket with metallic abstract design. 3 piece classic suit, cami, straight skirt, open jacket with rhinestone trim. PRE-ORDER WILL SHIP 5/15. One piece silky twill dress with bow-tied collar top, lace full skirt. Three piece suit with cami, slim pencil skirt, wide shawl collar patterned jacket in silky twill. 2 piece floral pattern, silky twill dress with jacket and jeweled brooch. PRE-ORDER WILL SHIP 3/15. Three piece silky twill geometric patterned suit, cami, long fit-and-flare skirt, collarless jacket and jeweled clasp. 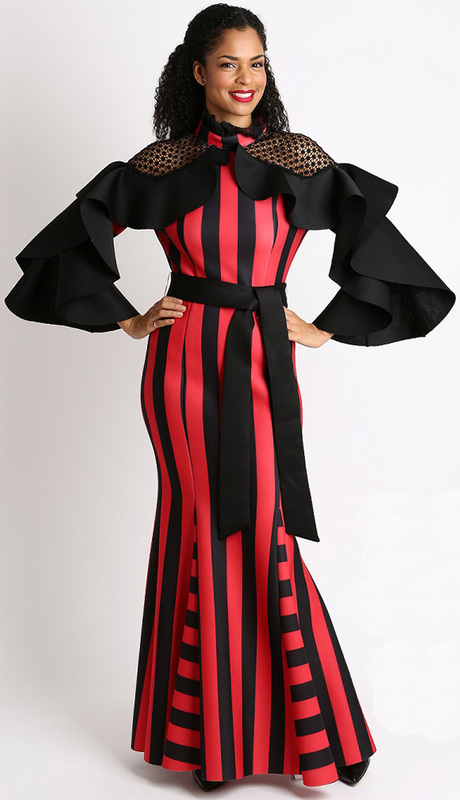 Two piece patterned long dress with fit-and-flare jacket, ruffle trimmed flare sleeves and ruffle collar. 2 piece organza floral printed, flared dress, ruffle collar jacket with fit-and-flare sleeves. 2 piece shantung suit with flared skirt, button front jacket in embroidered florals. 3 piece shantung suit, cami, simple jacket, long skirt with floral applique tiers. 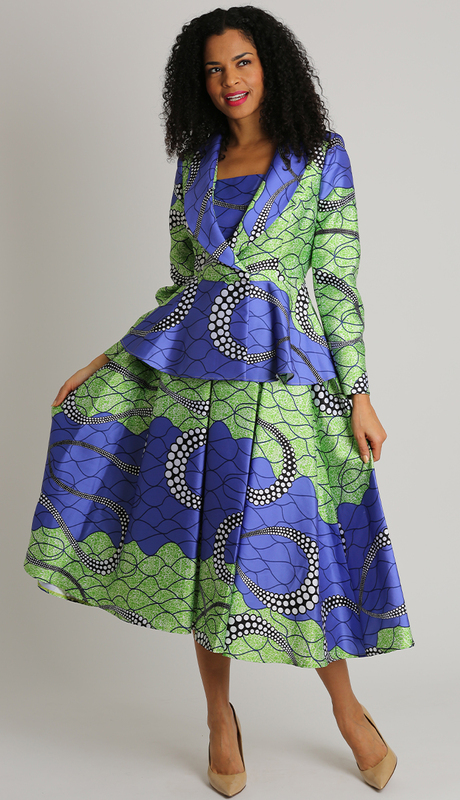 2 piece shantung suit, long flared skirt, button front jacket with swirl trim. PRE-ORDER WILL SHIP 3/15. Three piece suit with cami, straight skirt, jewel trimmed jacket with jeweled clasp. One piece crinkled crepe, full length dress with dramatic rose trim and bow-tie belt. 2 piece lace and stripe long sleeve dress with full skirt. 1piece lace, fit-and-flare full skirted dress with long sleeves and jeweled brooch. 3 piece breezy suit, cami, mesh skirt and jacket with contrast collar and cuffs. 2 piece lace dress with long hem and elbow length sleeves. 2 piece lace dress with handkerchief hem and open, long sleeve jacket. Only available in Champagne and Black. 2 piece lace long dress with open, long sleeve jacket. 2 piece linen dress with layers of color blocks, handkerchief hem, and loose flowy top.Only available in Sage/White and White/White. One piece sleeveless linen dress in color blocks, with asymmetrical hem and pockets. 2 piece linen dress with ruffled hem, handkerchief hemmed blouse in color blocking. 1 piece full length linen dress in color blocks with handkerchief hem. 2 piece linen dress with handkerchief hem, loose bell sleeves. 2 piece linen dress with handkerchief hem and loose bell sleeves. 2 piece linen full skirt and blouse with contrast hem. 2 piece linen full skirt and loose flowy blouse with contrast hem. 2 piece linen dress with full skirt, fit-and-flare buttoned blouse, tiered sleeves. 2 piece linen dress with full skirt, fit-and-flare buttoned blouse and tiered sleeves. 1 piece linen short sleeve dress with high-low hem and contrast top. 2 piece long, linen dress with full skirt and long sleeve blouse with embroidered trim. 2 piece linen loose pants and long blouse. Only available in Gray and White. 1piece linen full length dress with embroidered eyelet pattern. One piece robe in a silky twill with button front, collared v-neck, contrasting decorative trim and cross brooch. One piece silky twill, button front usher's robe with rhinestone embellishments.